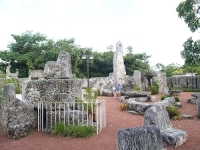 Legend has it that unrequited love led a Latvian immigrant to spend 25 years single-handedly carving a castle out of rock between the Florida Keys and Miami, on the South Dixie Highway. The amazing monument to the man's determination has been called America's Stonehenge and has been featured in numerous magazine and newspaper articles. Visitors are awed by the castle, which also contains affidavits from neighbours testifying to the fact that the builder had no assistance with his mammoth task. The creator, Edward Leedskalnin, once proudly showed visitors around the castle himself, but now an audio guide does the honours. This quirky attraction is fascinating to visit and fun for the whole family. Opening times: Monday to Friday 9am-6pm; Saturday to Sunday 9am-7pm.